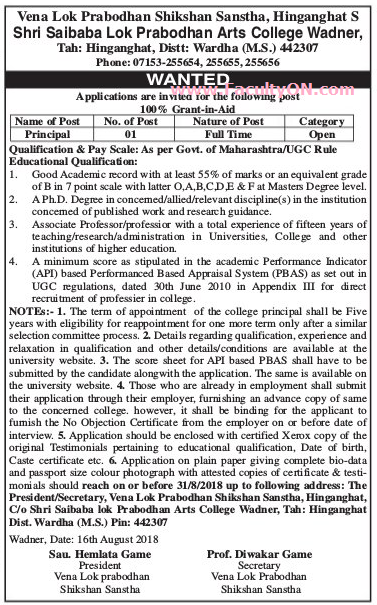 Shri Saibaba Lok Prabodhan Arts College, Wardha has advertised in the LOKSATTA newspaper for the recruitment of Principal job vacancy. Interested and eligible job aspirants are requested to apply on or before 31st August 2018. Check out further more details below. Qualifications: Good academic record with 55% of marks in PG with Ph.D. Full details are provided below. How to Apply: Interested and eligible candidates are requested to send their application on plain paper giving complete bio-data along with attested copies of certificates and testimonials to the given address below.